Do artistic pictures of exotic dishes make you swoon over food? Do you spend countless hours sitting on your comfortable chair and browsing through ious travel websites? Well, then you have all the rights to get a super dose of travel experiences, mouth-watering dishes, culinary traditions, and places of origin of the renowned food preparations, directly coming from the pen of travel and food experts. 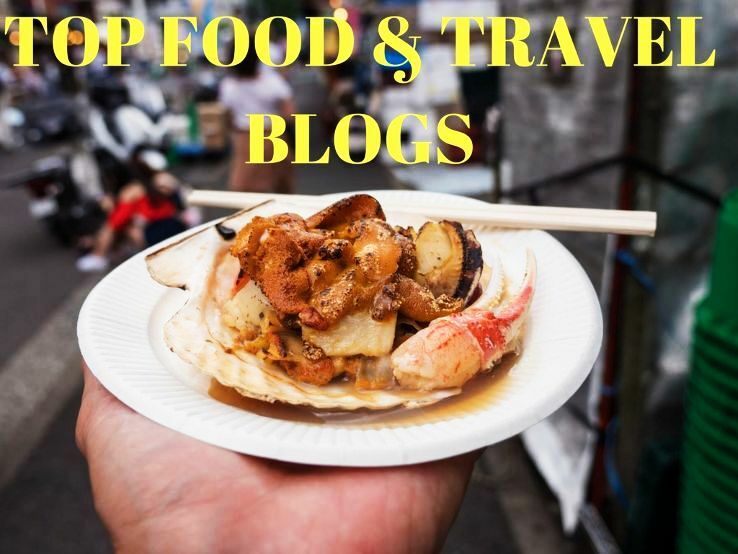 To ensure you get access to the best and most authentic writings, here is a list of TOP FOOD & TRAVEL BLOGS 2018. 1.Travel Wire Asia-Get the best and latest of the travel news and updates at Travel Wire Asia and plan your next trip fully prepared. The blog brings you the untold secrets and must-to-know facts of Asia travel hubs. Know Asian food, flora, fauna, and whatnot by following Travel Wire Asia. 2.GlobeJamun: As the name suggests, the blog brings you the best of travel and food from all across the world. The travel Diaries of blogger and travel 2 enthusiasts mishky and Urmi takes you to foreign lands and experience the local life and wonders. Whether adventure junky or food enthusiast, the blog has something for all. 3.Socialmaharaj-Everything that is social ought to be at Social Maharaj, a blog set up by Atul Maharaj. A POLYGLOT, as he describes himself, Atul is fond of cooking and learning languages. With love for sports, specifically cricket, he also happens to be a creative artist. With a iety of issues to address, his blog is a perfect place to spend time socially. 4.Oh My India : Oh My India! are exploring a new India! This is a platform where you can venture into the dynamic cultures of India, treat yourself to the vibrant Indian contemporary initiatives of the Nation, tour the lost, undiscovered destinations of this motherland and contribute to fashion the one-stop portal to show the world the epic India we know. 5.Rakhduu-Satisfied employees are the biggest treasure for an organization and at Rakhduu.com, you get ideas how to achieve this satisfaction. A food and travel company, Rakhduu helps corporates plan group picnics. They travel to unknown places and try unique food to share their experiences with their readers. ​6. FoodenthusiastsofDelhi : Food Enthusiasts of Delhi started as a blog and community in 2011 by Shashank Aggarwal . It wants to create a robust resource of food lovers for Delhi . The blog is a great source of information for people who not only live or work in Delhi but also for expats , tourists or travelers to the state of Delhi -NCR. 7.Migrationology – Food lover Mark Wiens introduce to you the most delicious and amazing food from around the world. 8.Our Awesome Planet – Food and travel blog by Anton Diaz promoting tourism in his homeland Philippines and describing his food experiences abroad. 9.Road Food – The most memorable local eateries along the highways and back roads of America. 10.2foodtrippers – Daryl and Mindi bring their vast experience with food and travel to the table as they share their new adventures here. 11.Legal Nomads – Digital nomad Jodi Ettenberg’s inspirational food & travel blog. 12.The Boozy Prune – The South African and International food, wine and travel blog that’s down to Earth but high on life. 13.​The World in a Glass – The site for food, drink and travel junkies. 14.Degustinations – Tasty bites of what’s on to eat, drink, shop and go in destinations around the world. 15.Dotted Route – John’s travel blog covers travel tips and good eats from around the world. 16.Etsy Explores – Eng Tat and Sheena’s adventures in slow travel, food and hidden gems. 17.Fork Sand Jets – A diary of a couple of amateur foodie traveloguers going around the world. 18.Road Trips for Foodies – Destination for foodies and food events around US. 19.Partaste – A food lover’s guide to must-try dishes, local recipes and authentic restaurants in top travel destinations around the world. 20.The Trail of Crumbs – A gastro travelogue featuring food, art, architecture, local culture and stories from the road. 21.The Travelling Table – Two canadians on a culinary road trip around America. 22.Road Less Forked – A girl with no shame in favoring meals over museums, tapas over trekking and drinking wine for lunch. 23.Different Doors – On their blog, a travelling couple from India, Revati and Charles, are combining passion for cooking, photography and travel. 24.Travelocafe – Laura & Cipri, photographers, travel writers and foodies are living a fulfilled life. 25.Market Manila – A food blog featuring recipes, ingredients, restaurants and markets in the Philippines and around the globe. 26.With Husband in Tow – Amber, together with her husband Eric, travel the world, in search of adventures in food. 27.Bacon is Magic – Ayngelina’s culinary travel blog featuring the people and places behind the meals around the world. 28.Taste Away – The most popular food & travel blog in Poland exploring cuisines around the world. 29.Candy Blog – Photos and reviews of candy from around the world. 30.Our Tasty Travels – Erin travels in search of good food, wine, beer, and other local beverages. 31.CC Food Travel – A food, travel and adventure blog about international cuisine with emphasis on Malaysian food. ​32.Tiny Urban Kitchen – Cooking, eating, and travel site with focus on Asia couisne by Boston-based Jen. 33.Eat Your World – An original online guide to the tastiest regional foods & drinks around the globe. 34.Dish Our Town – Family of 3, traveling, eating and photographing the world, one dish at the time. 35.KYspeaks – A Malaysian blog on food, travel, diving, party, and everything in between. 36.Places and Foods – A multiple award winning travel, food and shopping blog from Malaysia. 37.Food Travelist – Best food recipes from around the world shared by food travelers. 38.Nelson Carvalheiro – Nelson Carvalheiro is all about passion for people, travel and food. 39.Ever in Transit – Food and travel blog featuring travel tips, stories, and culinary adventures. 40.Motormouth’s from Ipoh – Asian food and travel guide with focus on destinations and taste of Malaysian. 41.Nola Chef – Food and travel blog. Liza is a New Orleans girl living in Buenos Aires since 2011. 42.For the Intolerants – A Canadian expat in pursuit of food, wine and travel finds so good they’d make you cry. 43.Connvoyage – Connie Hum is on a mission to travel the world, eat good food, laugh as much as possible, and blog. 44.Roamalicious – Roaming around the world, finding the most delicious food. 45.Go Live Explore – A lifestyle, food and travel blog with healthy recipes, travel guides and beautiful destinations. 46.Food Perestroika – Adventures in Eastern Bloc cuisine. Recipes, travel, and restaurants reviews. 47.The World and His Tuk Tuk – Chris moved form UK to Thailand. He is writing about local food and culture in Thailand and beyond. 48.Boy Eats World – Food orientated family travel blog. 49.Provecho Peru – Sharing the markets, kitchens and flavors of Peru. 50.Banana Roti – Food blog of a budget traveler. 52.Eating Adventures – The newest foodie tours in Hong Kong and China. Eat like a local in Hong Kong, Guangzhou, Guilin and Yangshuo. 53.Very Hungry Nomads – Find and book the best food tours, cooking classes & food experiences around the world. 54.Gastronomic Nomad – Discovering the world one bite at a time, while sharing food and travel advice. 55.Confused Julia – Julia, an English girl living in Amsterdam, blogs about her favourite things: discovering new foreign countries, cooking and eating mainly vegetarian food, and fashion. 56.Travel Drink Dine – Wendy from Australia takes you on the culinary journey around the world. 57.Bee Amazing – Sharing Bali travel tips & ideas, and Bali culinary delights. 58.Travel This Earth – Mica & Mike travel slowly full time since 2009, volunteering, documenting food & adventures, sharing stories. 59.Hungry in Taipei – A hungry girl’s guide to Taipei – a journal of finding good food and restaurants. 60.Travel Eater – Johanna is a travel & food writer and photographer, eating near and far. 61.Food and Photos RTW – Long-term travel advice through the eyes of o foodie & photograph enthusiast. 62.The Culinary Travel Guide – A site with focus on culinary travel, sharing food and travel news, information, inspiration, exclusive features, and firsthand culinary travel reviews. 63.The Gutsy Gourmet – Bring your travel memories back to life with this collection of international recipes for the home cook. 64.Eating the Globe – Travel writer Valen Dawson shows you what foods you shouldn’t miss. 65.The Dropout Diaries – A rat race dropout who is obsessed with street food especially Vietnamese, travel and her family. 66.Mondomulia – Giulia is an Italian food and travel blogger based in London. 67.Cook Sip Go – Dave Cole’s travel blog focused on connecting with the local life and cuisines of destinations worldwide. 68.Around the World in KT Days – Katie share her passion between traveling, eating and active adventures. 69.The Wandering Gourmand – Bryan helps aspiring travelers experience a world beyond mega-resorts, chain restaurants, and Bud Light by taking readers on a food and drink adventure around the world. 70.Eating Asia – Malaysia-based professional food writer and photographer explore street food, ingredients, and culinary traditions in Asia and beyond. 71.Will Fly for Food – A food travel blog for the gastronomically inclined. 72.Expat Edna – A serial expat travel blog with focus on food and photography. 73.A Taste of Travel – Journey of travel and food. Jenny loves a bit of luxury and good restaurants. 74.The Road Forks – Akila and Patrick travel, cook, and eat their way around the world with their two dogs. 75.Gourmantic – An online magazine with a focus on travel, food, bars and drinks, local and international restaurant reviews and events. 76.The Food Pornographer – Cynthia’s blog combines the things she love to do most: eat, travel, take photographs and tell stories. 77.A Table for Two – Billy Law has been living his food dream since leaving the popular cooking TV show in Australia – Masterchef. 78.Being Gluten Free – A lifestyle and travel site sharing gluten free recipes, travel information, product reviews and giveaways.